// Between the lines //: Not so "moelleux", but yummy!! Not so "moelleux", but yummy!! 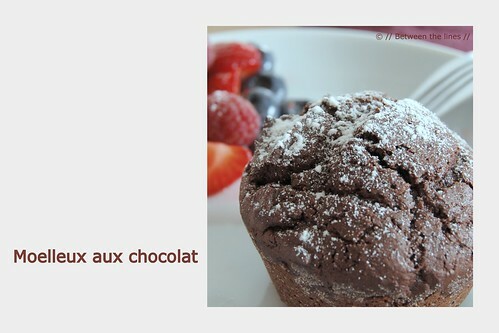 When I asked H. yesterday which birthday cake she wanted, I was totally surprised to hear her say "moelleux* au chocolat". She never had a "moelleux au chocolat" before to start with because of her egg allergy, and unlike her sister she's not that big of a chocolate eater. But it was her birthday after all and some birthday wishes, like the cake, need to be granted. Hence, I started an online search for "moelleux au chocolat sans oeufs". To my surprise I found quite a couple of recipes (here, here and here). So off we went to the grocery store for some cocoa, butter, flour and yeast. As we needed bread too, we made a stop at our local bakery (one of the many) and it was my lucky day (at that point it still was, that ought to change soon - just continue reading ;) ) as the baker himself was helping the clients. He knows about H.'s allergies and so I asked him for a couple of quick suggestions on how to bake a moelleux without the eggs - that's another thing I like about Paris: people know what they're doing and are (most of the times) very helpful in giving some advice and insight into their products. He suggested to use cream instead of milk. Perfect! We still had some in the fridge! Back home, the girls were really eager to start cooking. Cooking's actually one of H.'s favorite pass times. They'd already started to measure the flour, sugar, cocoa,... when I realized I forgot to turn on the oven. I turned on the oven - or I thought I did - but, hey, that was weird, the LED light didn't turn on, and I didn't hear the zooming sound the oven usually generates. And hey, the clock didn't work either. What about the burners? Same thing! Then I looked at the dish washer - didn't I turn it on before we left? And the washer? You guessed it: no electricity. I checked the other appliances and the kitchen light. Those seemed to work fine. A quick look at the fuse box, showed there was a problem at just one side of the kitchen, let that be the side we needed. Resetting the fuse didn't help, no matter how many times I tried. What about the neighbors? They had their electricity working just fine, they told us! Time to start moving those appliances to check the outlet. I pulled the dishwasher from under the sink and immediately found the culprit: a small puddle and water dripping down - from the cord! What had happened was that the drain from the dishwasher had come loose and the rest you can guess. Well, at least the fuse had done its job! I disconnected everything from that particular outlet, reset the fuse and we had a fully functional cooking range again! By that time, seeing the mess I had to clean up later, the dishwasher in the middle of our already tiny kitchen, and the entire content of the kitchen cabinet where the leak was on the floor, my good mood had gone way down below zero. I decided to finish off the batter myself - sorry, girls! next time I'll make sure everything works just fine, so you can do the cooking! Promised! I greased the muffin pan and threw everything in the oven - for 30 minutes, just as in one of the recipes I found. 30 minutes - for a big sized moelleux, that is... Way too long for a muffin pan, though, but I only realized this after the second batch had come out! Hence, we had 12 "moelleux au chocolat" which turned out not to be moelleux at all! The heart of the moelleux should be silky and creamy. That's what it is all about - tenderness, not done-ness. Sure they tasted really good, and so said the girls and their friends too, but honestly: they were overdone. In an attempt to save mine, I poured some really strong coffee over the center, and I must say it not only made it more moelleux, but it tasted really good too! To the extent that I actually might incorporate the coffee in the batter next time I make them. 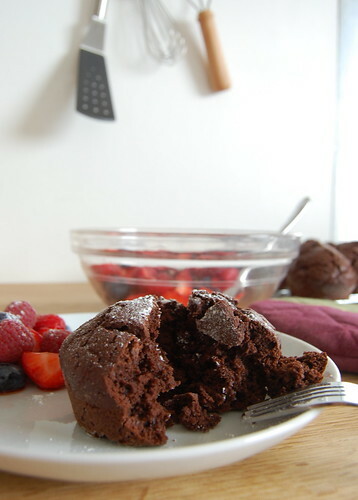 If, after reading all this, you're still interested in making some "moelleux" yourself, then keep on reading as here's the recipe. The recipe might be subject to some minor changes still, which I will add as I go. The nice thing about this recipe is that it's egg-free and hence makes it suitable for people with an egg-allergy. The recipe is based on the recipes mentioned above and I added the suggestions made by our pâtissier. If you fancy a nice French desert, you definitely need to try the moelleux! 1. Heat the oven to 180°C (350°F). 2. Mix all ingredients in a mixing bowl and with the mixer on medium speed, mix until a smooth and silky batter is obtained. Add milk, if necessary, one tablespoon at the time. 3. Grease a cake pan or muffin pan. Next, flour the pan, to avoid the moelleux to stick to the pan. 4. Pour the batter in the pan (when using muffin pans, fill to about 1/2 to 3/4 height). 5. Bake for about 30 minutes when using a large pan or 20 minutes when using a muffin pan at 180°C (350°F). A toothpick inserted at the center should come out slightly creamy; the top though should have a nice crust. 6. Let cool down in the pan for about 5-10 min, next out of the pan and on a cooling rack. 7. Optional: Sprinkle some powdered sugar on top. Very nice when served with vanilla ice cream and/or red fruit.